I had a conference to attend in San Diego this past week and decided to extend my West Coast visit to visit my brother-in-law and sister-in-law in Los Angeles. We had a pretty low key weekend before I headed down the coast - but managed to take in some great cuisine! 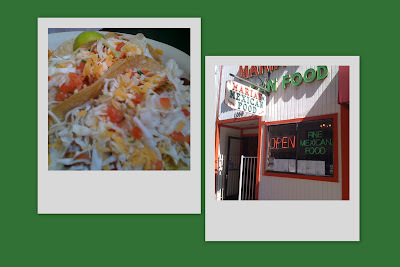 Here's a quick recap of my food tour of LA and San Diego. One reason my brother-in-law was excited for my visit (besides catching up) was the opportunity to go out for sushi. We got a little excited and ordered way too much! But it was delicious. 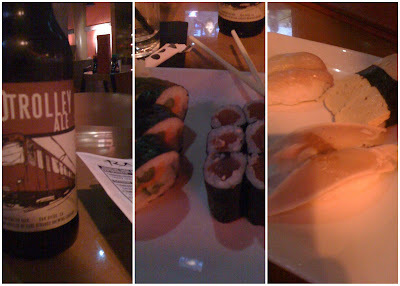 We went to Oishi Sushi - according to one review I read, it is the "least sceney spots in Beverly Hills". I agree - but the rolls were big and delicious. Whenever I'm out in California I try to order fish that we don't always see here in Boston. We had some great albacore. 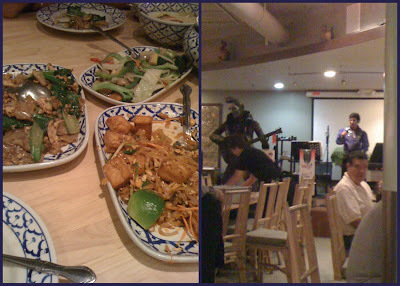 For our Saturday night adventure, we trekked over to Hollywood to witness the excitement that is Thai Elvis. This man has been impersonating Elvis for 30+ years - and the food was great too! We had some pad see ew, chicken green curry, and veggie pad Thai. The Thai Iced teas were like slushies and perfect for cooling off after the spice. After a fun weekend in LA, I hopped on the Pacific Surfliner and headed down the coast to San Diego. I never have high expectations for conference food, so I made sure to get some restaurant recommendations before I left for CA. I'm glad I did! I had three great dinners and a delicious lunch. It's fun to be solo diner sometimes - you can strike up conversations with strangers and get great recommendations from the bartenders! I didn't get pictures from my first dinner at the Princess Pub. I had the 'best fish and chips in San Diego' at this English pub in the Little Italy neighborhood. Had a great California brew - an award winning Firestone Walker Union Jack IPA (delicious). The next night I was starving after the conference function - so I headed out into the Gaslamp Quarter looking for a place to grab some dinner. I decided on sushi - more albacore and Hawaiian yellowtail. And another local California brew. I had almost a full day for site-seeing before getting on the red-eye flight back to the East Coast. I asked the hotel concierge for a tip on a good Mexican place that he would eat at (not a tourist destination). I knew he was pointing me in the right direction when he told me to "go to Maria's, she should be open now". I got a fish taco (when in San Diego...) and was very happy! 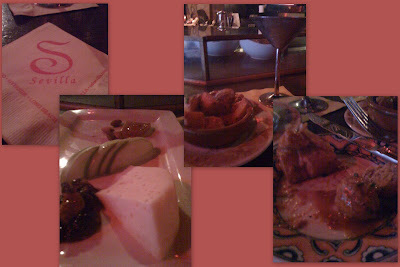 After spending the afternoon touring the USS Midway, I headed back to the Gaslamp Quarter for a tapas dinner at Cafe Sevilla, a recommendation from a well-travelled college friend. I pulled up a seat at the bar and found out I made it in time for half-price martinis and tapas. The bartender, Ray, recommended some albodingas in a sherry garlic sauce and I also ordered the spicy potatoes. To wash it down, I had a margarita-tini. I had never heard of Licor 43 before, but now I'm a fan! Of course no meal is complete with a cheese course, and this was no exception. I tried a creamy tronchon tres leches that was served with almonds, chutney, and preserves. A great end to my West Coast swing!